21.1 km : Courage to start. Strength to endure. Resolve to finish. The excitement is reaching a fever pitch…..! You registered…got your confirmation….and now it is finally happening ! Butterflies in the stomach (Yeah even the been there done that types get it. Just don’t fall for their pseudo-cool demeanor !). 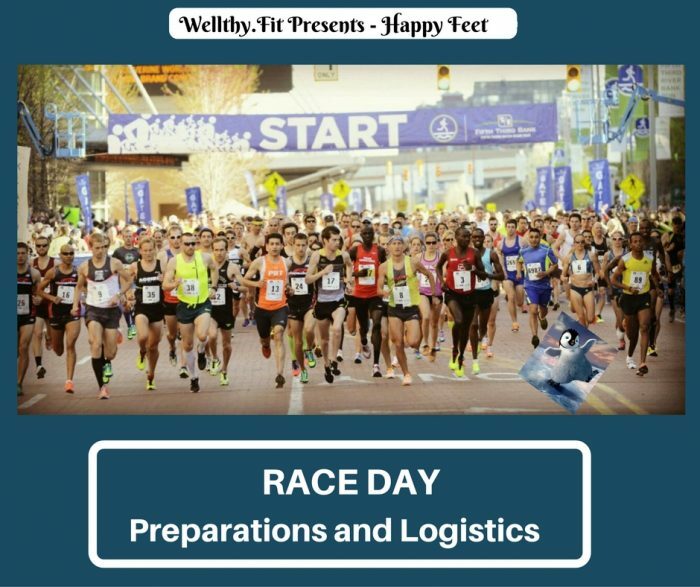 The buzz and the chatter of the race day is making us light headed and confused…..some tips to help you focus and crack that PB ! Remember – routine rules…checklists work…and NOTHING NEW ON RACE DAY ! Have an early dinner – preferably easy digestible low fiber, high carb. Continue to hydrate. Just don’t manufacture a gastro–intestinal emergency for the night or the morning. Layout out your gear. Don’t overdress. Maybe carry a disposal sweat shirt for the pre-race cold. Triple check race specific stuff like bib, pins, anti-chaff cream/tape, gels, hydration, some cash, ID, etc. Read up on the latest traffic advisories, road blockages. Google Maps alone will not do. Reconfirm your move plan to reach the venue. Try and sleep early – NOT so easy ! It is okay to obsess about not getting up or reaching the venue on time. Frankly, even if you get little sleep, it is okay, provided you have been getting enough sleep the last few days. Set multiple alarm clocks. In all probability you will not need any of them ! Once again – wake up early. Get your morning routine done with quick. Eat a light breakfast – again easily digestible low fiber and high carb (approx 500 cal is enough). Two bananas, oatmeal with #Societe Naturelle Honey or a sandwich with the same brilliant natural honey will work wonders. Plan to reach early – traffic stoppages, parking hassles, bag check-in, security check, etc. Important – recheck all your stuff before leaving home. Link up with your running buddies (not easy in the crowd) – the banter eases the jitters ! Some selfie and pre-race pic time ! Don’t get carried away by the pre-race warmup hoopla. It is infectious. Enjoy the atmosphere and the energy – but we don’t want you tired even before the race. Just do your regular routine. Eat your gel / energy drink at the correct time ! Get to your enclosure early. Maybe one last visit to the Porta Potty before that – the line will be long ! Start at your planned pace – don’t start too fast (the energy of the event does that to you). More importantly don’t fall in the initial mad dash or the crush of the crowd. Divide the race into four 5 k’s or three parts – the start (5k), the sustain (6 to 15 k), the finish (16 to 21 k). Or run with a pacer ! Either ways run with a plan. Use the string technique. Imagine a string tied to the runner in front of you. Reel him in ! Such a thrill to continuously overtake one runner after another – motivational hack, especially towards the end game. Use positive self affirmations all the time to beat the devil who keeps pestering you to slow down, walk or give up. DAMN ! YOU ARE MADE OF STEEL. Don’t forget to hydrate. Our suggestion – do it every 2.5 to 3 Km. A walk break is okayyyy. Just don’t have one more than 30 secs. Have fun – it is a rare experience. Enjoy the cheer leaders, high five max possible strangers, look for photographers and get some super race pics (tip – practice your poses beforehand !). If you are really cool – get your own cheerleader crowd. Do cheer the other runners super loudly. Notice the small things, the atmosphere, the energy. After all you will tell the story of your victory for a long time to come! Finish smiling, fast and strong! Look really cool and fresh. Plan and practice your victory pose – a la Usain Bolt ! (Insider tip – the max pics are taken here). And remember to stop your app – PROOF is a must ! Cross the finish line and move ahead. Get over your cool down routine quick. The tendency is to skip it with all the activity going around you – DON’T. Collect your medal and eats – replenish and re-hydrate. Find and cheer your friends – its celebration time ! The half marathon is a personal victory. The culmination of a commitment, a plan, the hard work and the dedication. An affirmation of your commitment and resolve! 21.1 Km……You Can….You Will….End of Story! And don’t forget to step on the timing mats !!! !